"This is a really exciting find," said local archaeologist Laura McLean. "To find a hoard still located in its Bronze Age context, below the level of ploughed soil, is very rare. The fact that there is pottery involved makes the find even more unusual." 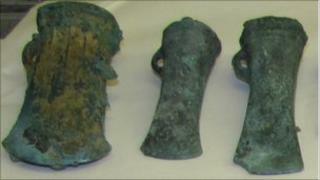 The location was reported to archaeologists at Colchester and Ipswich Museums by a landowner from the Burnham-on-Crouch area and Mr J Humphreys, a metal detectorist. Three other hobbyists then came forward to report more finds in the same area including the top of a pottery vessel. "This is a really exciting find and a good example of metal detectorists and archaeologists working together to uncover and record our history, making sure it is not lost forever," says McLean who acts as local Finds Liaison Officer for the Portable Antiquities Scheme. The excavation at the Bronze Age site was filmed and the objects have been removed to allow archaeologists to carry out their studies. As the intact pot was so fragile and the contents were heavy, the decision was taken to "block lift" the vessel and transport it to the museums laboratory for further study. In block lifting, the soil around the object is excavated and the object itself is sealed - on this occasion in cling film - to preserve it intact and to prevent damage when transporting it.